Step through the unassuming Third Street entrance of Spring and you’ll be transported to Provence by Chef Tony Esnault and his wife and partner Yassmin Samardi. Following on the success of their bistro-style Church & State in Downtown LA’s trendy Arts District, the two have now brought the flavors of southern France to the table. Chef Tony Esnault displays his Legumes des Saison. 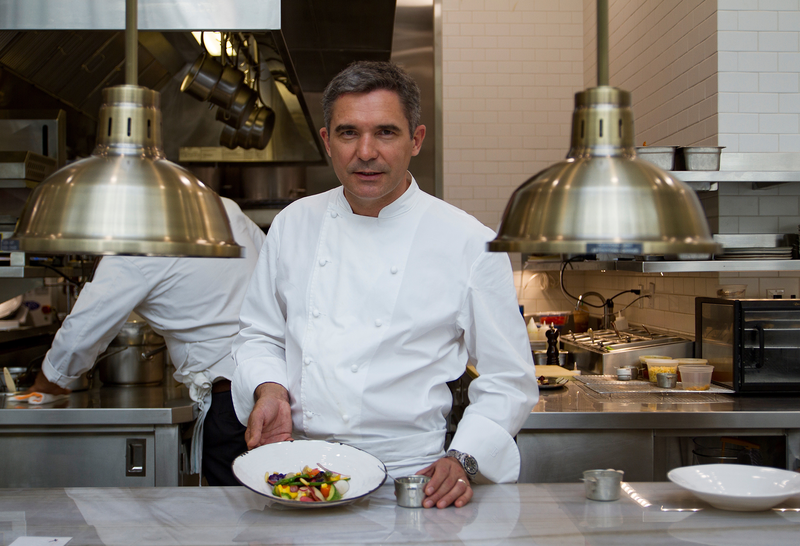 Step into the world of Chef Tony Esnault's upscale French cuisine at Spring. Spring is located in the historic Douglas Building a few doors down from the headquarters of the LA Times. The restaurant, with its soaring glass ceiling, atrium-style dining room and fountain, is what Jonathan Gold calls “one of the most stunning openings of the year.” The open kitchen allows diners to observe the discreet hum of food being prepared, sauced and garnished under the watchful gaze of Chef Esnault. Trained by the legendary Alain Ducasse in Michelin-starred restaurants, and with a meticulous eye for detail and an incredible level of exactitude, each of the resulting dishes at Spring is an objet d’art when it arrives at your table. “There is a radiance to food in its natural state that you don’t want to undermine,” says Chef Tony Esnault. Butter is used in much of the fare at Church & State, but the menu at Spring relies instead on olive oil to bring every ingredient to life. Jonathan sings the praises of the Provençal bourride, a saffron fish stew he calls “a statement of purity and strength of flavor.” The magret de canard is also not to be missed. The duck breast is aged, slow-roasted and served over a demi-glace with turnips, kohlrabi, radishes and a cherry sauce. Jonathan recommends the intensely flavored risotto with morels and asparagus, too. At Spring, the wild escargots are imported from Burgundy and finished with an herby-garlic persillade. Esnault serves them as a warm salad with tangy tomato and fennel accents. The fraise, estragon et basilic at Spring gets the gold stamp of approval from LA Times food writer Jonathan Gold and ‘Good Food’ host Evan Kleiman. For dessert, expect the unexpected if you order the fraise, estragon et basilica. The dehydrated crunchy basil and tarragon herb cake comes with a verdant basil and tarragon granita, strawberry sorbet, macerated strawberries and rhubarb. It is—both Jonathan and Evan agree—delicious. Recommendations: Try the legumes de saison, the bourride, the magret de canard, the Provençal escargot and the risotto. For dessert, leave room for the fraise, estragon et basilic. Every dish passes under the watchful eye of Chef Esnault to be sauced or garnished before being sent to your table.